A rare opportunity to explore highlights from Alison Uttley’s remarkable archive, within a building of breath-taking beauty. Alison Uttley was the second woman ever to graduate from The University of Manchester, with an honours degree in Physics in 1906, and a blue plaque is displayed in her honour at the University. 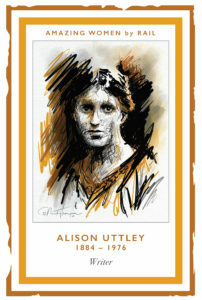 The Alison Uttley Archive is held at the University of Manchester’s John Rylands Library on Deansgate. It includes an extraordinary set of Uttley’s diaries, spanning the period from the 1930s to the 1970s, which document her life and times in incredible detail. The Collection Encounter will also include a selection of her correspondence and copies of her works, in manuscript and typescript formats. Aliso Uttley once lived in Knutsford and is being celebrated as part of Knutsford Promenades’ ‘From Station to Station’ celebration of Amazing Women. A grande dame of British literature, she was the author of more than a hundred books, the best known of which are her country novels and her many books for children. This event is an outstanding opportunity to discover more about this complex and extraordinary woman. Uttley herself was the subject of a fascinating biography written by Professor Denis Judd based, in large part, on her diaries. There is no parking at the Library, due to its location. Entrance to the Library is through a modern extension that links to the Historic building and is fully accessible with level access. There is a power-assisted entrance door to the left of the revolving door, operated by a push button. Please be careful, the floor is slate and can be slippery in wet weather. Mats are used to keep the floor dry. There are portable folding stools available in the Atrium which you can take with you as you explore the Library. There is one accessible toilet in the basement of the modern building.